Received pronunciation, or BBC English as it is sometimes known, is, increasingly, a thing of the past. In today's world to speak in such a way is perceived to be neither with it, nor cool. No wonder then that, The King's Speech apart, there is little or no interest in elocution or the mastering of tongue-twisters in the manner of Peter Piper Picked a Piece of Pickled Pepper or She Sells Seashells on the Seashore. Shaw's Pygmalion is as outdated as the proverbial Dodo! Which, indirectly, brings us on to the subject of shells which, here in our Budapest apartment, are something of a motif. 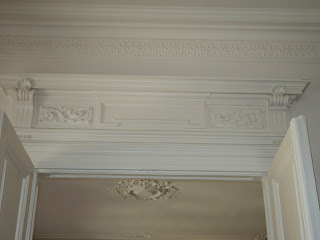 To begin with, they recur in much of the late nineteenth century plasterwork on ceiling rose, on cornice and on coving. They appear, as wood carvings, above the door frames of the principal rooms and are to be found over and above the tall looking glasses which serve to illuminate the Main Hall. Most recently, we have added a shell to the pediment of some painted bookshelves, incorporating an H into the design. Much of our Belleek porcelain carries the Second Mark, dating it between 1891 and 1926. 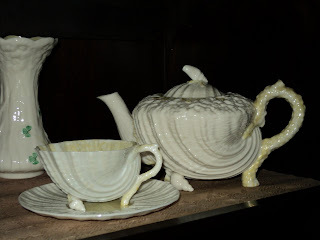 Many of the paper thin pieces take inspiration fom the sea, the teapot for instance is supported on three winkle-shell feet, whilst the cup is itself in the shape of a shell. The pearly glaze, the secret of which was bought by the Belleek company from a French inventor, defines so much of the porcelain. 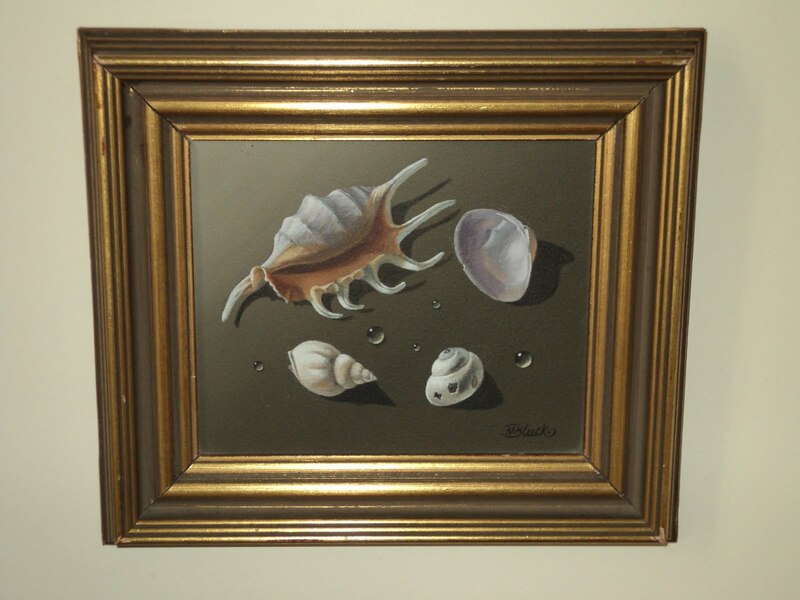 A small oil painting depicting shells is by the surrealist artist Norman Black [1920 - 1999] and was a gift from the artist. It hangs in the Morning Room, alongside other examples of his work, in a small group of seascapes. ﻿And next week we leave for our 'rooms' in Brighton where we shall hope, weather permitting, to find ourselves gathering seashells on the seashore. Even for people who don't like fussiness, marine creatures are interesting. It is ineviable that swirly shell-like shapes, presumably taken from nature, were very popular in the rococo period of the 18th century. I have seen as sorts of rococo decoration on ceramics, furniture, frames for paintings, mirrors, plaster work on walls and ceilings etc etc. But shells in the late Victorian and Edwardian eras stand out more since they are not so expected. Perhaps they derived from two separate impulses eg 18th century shells might have been trying to match Versailles; Edwardian shells might have been a marine section of art nouveau. I love the shells, the ones over the door, mirror and on various items and the ones on the beach. I've made sure there are plenty here on the beach for you to find. You'd laugh, but I'm no actually saying out loud - she sells sea shells - which is getting me funny looks from people here, but hey ho, I'm smiling - thank you! Thank you so very much for this most interesting and detailed comment. Although our apartment dates from the 1870s, there are many Art Nouveau references to be found in the plasterwork and wood panelling. We are intrigued by the idea that this may have been subject to influence from marine elements. Budapest does indeed have many similarities with Paris, the main boulevard being modelled on the Champs Elysees [and intended to rival it in its day!]. We are so pleased that you like the shells too. Actually, we find that there are not so many shells on the beach in Brighton, plenty of pebbles though! Strange looks....surely not in Brighton!! Your teapot is exquisite! Love those little shell feet and the body itself is just beautiful. 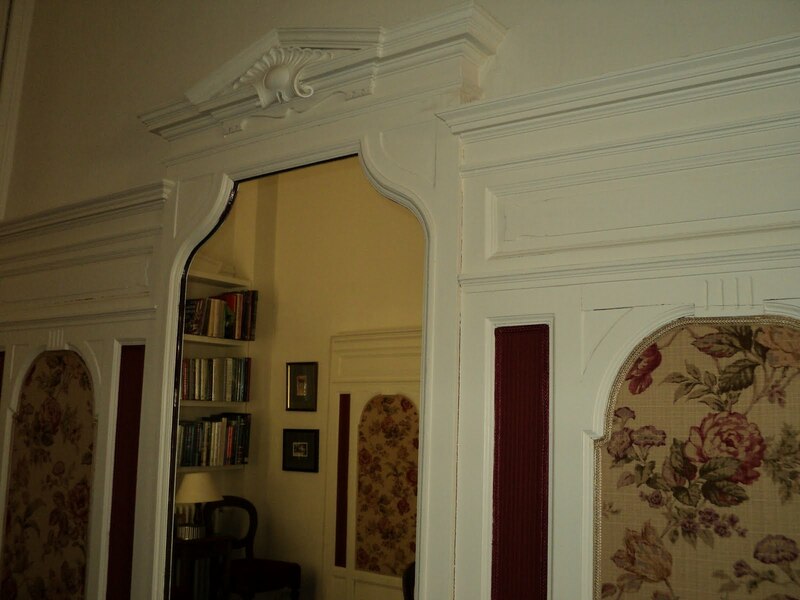 The moulding around your doors with the shell motif is equally beautiful. Thank you for this glimpse inside your apartment and your life! Very Lovely. Such kind words. Thank you so much. The teapot has been in our family for the best part of 100 years,so it is very special to us. We have to keep it in a cabinet as the porcelain is very fine and could so easily break. My glamourous assistant is probably one of the finest stucco artists in the country - it can't be easy! We are very pleased to hear it....about the pheasant that is. An artist in stucco, we are intrigued to know more. That's what he specialises in, and has restored many English country houses which have suffered from neglect or even fire. He works in real lime stucco, and usually in lying on his back as he models foliage etc. direct into the stucco before it dries out or falls off the ceiling! I think he worked at Uppark, and I know he worked at Prior Park - his portfolio is very impressive. If you need top quality, traditional work done, he's your man. Thank you so much for getting back to us. He sounds a most interesting person and, these days, there are fewer and fewer real craftsmen [or women] to be found. Uppark we know very well both pre and post fire. Prior Park we have yet to visit. What a fabulous apartment! I just discovered that you have your own blog- I have a very good friend who recently moved to Brighton about a year ago, and I'm actually visiting Budapest in the next week. Great blog! How very generous - thank you. Although we have had an apartment in Brighton [London by the sea] for some years now, we think of Budapest as home and it is certainly where we most like to be. We very much hope that you will enjoy your trip to Budapest and that you will, at some point, return when we should be delighted to show you around. Thank you for becoming a Follower! Have a fabulous time in Brighton - lets hope Patsy behaves herself while you are there! It is so kind of you to say so. Happily we have a full time housekeeper who is not only an excellent cook but who is also adapt at waving the feather duster. We shall be in Brighton for about ten days but are taking, in addition to our buckets and spades, the computer to remain in touch. We shall most certainly keep you updated on PP!! Shells... I was thinking that, despite Venice is next to the sea, shells aren't so common in old Venetian palaces decorations. It sounds quite strange, doesn't it? Maybe because people always love more what they can't easily have? It's great theater in a beautiful and quaint little part of Ontario. Also, your sea shell themes are beautiful--both the affixed ones and the portable (gorgeous Balleek). I am looking forward to hearing about gathering seashells on the seashore! This is a most interesting thought and yes, places like Venice, which is on the sea, look further afield for inspiration with which to decorate their houses. How really kind of you to provide the link - the theatre sounds wonderful and we shall certainly follow it up. And no, seriously, we cannot readily imagine life without Shaw, or at least his plays which, happily, continue to endure. Next week we shall post from the beach, we promise! Well, I believe that here in Arles, as in much of Provence, sea shells have long been used in decoration as a reference to the pilgrimage towards Saint Jaques de Compostelle in Spain. Those that have made the pilgrimage return with a shell on their walking stick (or backpack). We have a set of 19th century dining chairs with a lovely hand carved shell on top of each of them and the fireplace in our previous home was similarly engraved. Wishing you both a fine voyage. A sumptuous apartment for which you'd need serious money in the UK. How do you keep the ornate decorations clean? Lovely post. 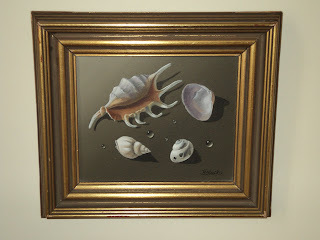 Makes me want to head for the beach, collect lots of shell and decorate a mirror! Ahhh lovely decor, it reminded me of the home of my youth, the gilded, carved doors, the ceilings that you look at and never get bored... brings back memories. :) Its sad that we have lost alot of the values and codes we have had prior to the wars. If I could go back in time, I'd go back to those beautiful, forgotten epochs. Pygmalion is one of my favorite plays. How exciting that you will be in Brighton finding sea shells by the sea shore. Unlike you, I do not intend to visit my Brighton homes for some years, so you can walk safely. For Patsy spotting (and others) try Waitrose, or even opposite at Taj (now my absolute favourite shop). It is so interesting what you say about pilgrims historically returning from Spain with shells - something we had not considered. Your set of dining chairs sound lovely and are just the kind of thing we like. How really kind of you. Alas, we ahould not have the first idea how to set about cleaning the mouldings, etc. but we do have an excellent full time housekeeper who, when not cooking, is, it would seem, perfectly happy to be waving a feather duster from the top of a ladder! What a splendid idea. And why not? Think of all those shell decorated items made by the Victorians [usually, it has to be said, by women with too much time on their hands]. Yes, we are very fortunate to have an apartment, built in the 1870s, at the height of prosperity not only for Budapest but also for Middle Europe. Although it was in multiple occupancy during the Communist period, and had not been touched for 50 years, we have been fortunate to restore the apartment to something like how it was originally. We are, indeed, looking forward to our days in Brighton but we are always glad to get back to Budapest. Unfortunately, Brighton beach is exceedingly pebbly, making it quite difficult to find shells! We are most intrigued that you too have homes [singular noun in our case] in Brighton which is, we think, a fun city. As for PP, we shall avoid her if at all possible. Taj did have a branch until very recently at the bottom of St. James'. Sadly now closed. The recession? The one opposite Waitrose is much better! Thank you for that. We'll be in there next week - skipping about Brighton with a bus pass! I adore your Belleck porcelain...when you say paper this, I can just imagine how delicate they must be. I think I would have jumped with joy once setting my eyes on them. I grew up by the sea...in fact it is now called Manchester-by-the-Sea, in Massachusetts. I naturally gravitate too anything collected by the seashore. I have a large bowl by our doorstep filled with treasures. I pack it up and drag it from country to country and would never leave one without it! I thought of you both yesterday. We went along to Lancing College and you were right, the chapel is just glorious. I could not think of a lovelier setting for a school. The art department is set in a building with the most beautiful natural light and the views are just amazing. Enough said from me!! Wishing you both a wonderful day! Yes, the Belleek is lovely but is exceedingly fragile so is kept in a cabinet. It has been in our family since new!! Your bowl of treasures sounds fascinating and we love the way it is always with you, travelling from country to country. Perhaps a post on it one day? WE are so pleased that you liked Lancing. Yes, it is the most wonderful situation high on the Sussex Downs with glimpses of the sea. You too have a lovely day. Received pronunciation or BBC English...interesting focus. It's interesting to think about the wide range of pronunciations and dialects for the universal language. Even just within Canada it makes for an study. Of course language is a living thing and, as such, cannot be expected to remain static. Regional accents, and dialects, make for interest and are, in our view, a strong contrast to the sameness of much of today's world. Hello Jane and Lance - regional accents and dialects are a thing of beauty, imho, but murdering the language is not. I detest poor language skills and hearing "Where you at?" makes my ears itch. Although, there is a young man in town who works at a grocery store and at a fast food restaurant and hearing his poor language skills is negated by his Wonderful attitude. He's always got a smile on his face, he's always got a kind word and he always acts like the person standing in front of him is The Exact Person he wanted to see. I'd hire him over the surly personality with perfect language skills; he has the right makings and language skills may always be upgraded but surly is bone deep. Your Budapest apartment is lovely; I am so looking forward to my visit to Hungary! You put this so well. Regional accents, which can be a delight, are one thing, sloppy mis-use of language quite another. But above all else, a warm, welcoming personality is what counts and what, we believe, we all respond to. And whenever it might be, we shall be delighted to welcome you to Hungary!! Sigh - your life sounds delightful - so happy for you. Is it possible that I say this each time I comment? As for the language - although I find it fun to create words and slap dash around with the language, I do love true language decorum and proper use of it - it is why the British seem so much more elegant and interesting than Americans. And also, why so many in our country fear and loathe our President. He has such eloquent use of the language. I love him for it. The shells - ah, the shells - the teapot, what a treasure, as are your posts! Have a lovely time in Brighton! You are so very kind. It is very true that your President, unlike some of the previous ones, is an exceedingly good orator; we always find it a great pleasure to listen to him. The shells are indeed great fun. Perhaps we shall gather up some more in Brighton!! Your post is a reminder that it's the delicate details in life that bring such richness. The shells are lovely. Thank you for sharing pictures of your beautiful apartment and artifacts. It is interesting that you show three, such different interpretations of the shell as a decorative devise. I suppose there is always the chance that a clam might hold a hidden treasure. What a brilliant collection of shells you have. Older style apartments anywhere n the world have so much more character than the modern day sterile boxes that are being built today. I would imagine the plasterwork decoration in your dwelling was a social comment at the time it was built as to the social standings of the original occupants. That is beautiful archetraving that you have in your apartment and so unusual in that in features shells, when flora was usually incorporated. Do you know the history of the shells? Gorgeous teapot by the way, marvellously crafted. Many thanks for your lovely comment and for stopping by! The shell details in your Budapest home are beautiful. I love the idea of a room decorated with shells like shell cottage in the grounds of Carton house, County Kildare, Marianne Faithfull lived there for a while. Have a lovely visit to your other residence in Brighton and enjoy the beachcombing. Lovely post, i like your porcelain, it's look verry nice. The Belleek porcelain is amazing, I would love to get a closer look. The next time you visit Vienna, I recommend the Museum Liechtenstein. The museum offers a superb porcelain collection and special shows, too. A friend of mine works there as a guide. I need him to explain everything to me, since I know almost nothing about porcelain. My dears, I loved it! Your high ceilings are so grand and their details are exquisite. Have you ever read Rosamunde Pilcher's novel, The Shell Seekers. It's very middle brow but a lovely gentle story. I hope you have a spiffing time in Brighton. The weather in UK has been blissful. I've been to Brighton once and I loved it. She sells sea shells...yes, I do remember saying it out loud in my grandfather's sitting room when he taught me some elocution lession. The other one said "She saw six ships sailing on the sea". And how about saying this phrase elegantly "Soft Moonlight". I've been in a state of collapsed soufflé after organising the royal wedding party with Richard which went very well. Dear Jane and Lance, a belated hello and thankyou for your lovely, thoughtful comment over at my blog, very pleased to meet you, and delighted to be following such an interesting and unusual blog; I am in love with both your drawing room and your lifstyle! How wise you are. We often feel that the small, simple pleasures of life are really the best in all things! We really enjoyed your witty comment. Thank you. Yes, there are many different architectural features in the apartment as it had been left unchanged for 50 years when we bought it. It has been fascinating peeling away the years! We understand that the first occupants of the apartment were a wealthy Jewish family and this would, indeed account for the many interesting architectural features that abound in every room. Latterly, the apartment was in the hands of underground, anti-government protestors who ran a printing press from the apartment. No change there then!! We could go on too! But, it always seems to us that we are out of step in being mindful of the details of language. The rest of the world seems not to care a jot....but, clearly you do too....so now we are three!! Yes, we agree that shells seem to be rather unusual but we have no idea why they should have been chosen over other things. Pygmalion will never be out of favour with us either. Such a fun idea to think of it as a modern Wills and Kate! We are delighted that you like the Belleek too. We only have a small collection but rather think that we might try to obtain more pieces. They are, as you say so finely crafted and beautiful to look at and hold. We love the idea of the shell cottage at Carton House that you mention and shall find out more about it. Many years ago we were entranced by the shell grotto at the Menagerie in Northamptonshire. An amazing piece of wizardry with shells! We are so pleased that you like the porcelain too. It has been handed down to us in the family and we are really very fond of it as well as the memories it holds. Thank you so much for the tip for and the link to the Museum Liechtenstein. This sounds to be exactly the kind of place we should like to visit. And, how wonderful that there are guides.We find that this often makes a visit even more interesting. Thank you so much for your very generous comment about our apartment. The ceilings are about 4.5m high and that does add a sense of drama to the rooms we find. It is also very practical in Summer since although there are days of 40C, the interior of the apartment is always a pleasant temperature. We enjoy Brighton as our 'rooms' face the sea which is, we find, endlessly fascinating. You really must not tire yourself out so, especially with catering. There are cooks and Waitrose!! How wonderful to hear from you and to see that you are a Follower! We are so pleased that you have enjoyed what we have written and, thank you for such a generous compliment about our apartment. What fine plasterwork, and the glimpse of the apartment looks lovely. May we see more? That is so kind of you. 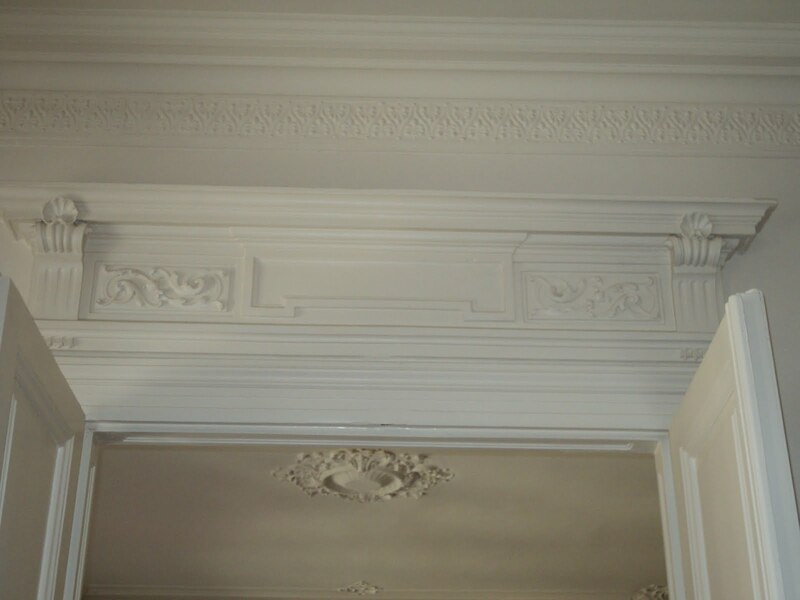 In time we shall hope to be able to show more of the architectural details of the Budapest apartment. For now we are in Brighton so the next post will be UK based! What a beautiful ceiling you have in your apartment. It is the art of high-level, absolutely love it. Hope your trip to Brighton is successful and that you may enjoy fair weather when you arrive. What a very kind and generous comment. Thank you so much. We have now arrived in Brighton where the sky is wall to wall blue and the spring sunshine is making everything look so pretty. What utterly stunning plaster work. If I could go to elocution lessons to be taught RP I would sign up instantly - on a bad day I sound like a female Billy Connelly. We are really pleased that you like the plasterwork. It does add an impact to the rooms. Never mind sounding like Billy Connelly....can you tell jokes as well?!! Just wanted to say that I didn't mean to run down Brighton or offend you. I know you have a place there and when we drove home yesterday and passed the beachfront apartments I thought about you and wondered which was yours. Apologies if my descriptions annoyed in any way. It wasn't meant to. Of course we are not in the slightest bit offended so please do not worry. We did not take what you said in the 'wrong' way at all and yes, parts of Brighton are very tacky indeed. Thank you so much for taking the time to comment. All is well, we do assure you. How unique the Belleek porcelain is. Looking like large shells. How exciting that you have been docents. I would definitely love to get to know more about Hungarian artists! We really enjoyed our time as Docents and learnt a huge amount, as you may imagine, not only about Hungarian art but also about contemporary art in general. Yes, the Belleek porcelain is great fun and quite unusually shaped. 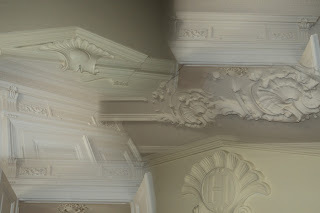 Your plaster and mouldings are exquisite! My stomach has butterflies just looking at all the splendor! Sea shells in any motif are God's handiwork glorified and yours are just lovely! great details in door surroundings! What a lovely, lovely expression, 'God's handiwork glorified'. We will never claim it to be our own, but we think that we shall be very tempted to use it! Thank you so much for your very generous comment. We are really fortunate to have so much original plasterwork and wood carving in the apartment. It is, we think, very typical of the period. im so following you two =) have a great day! We are so pleased to welcome you as a Follower. Thank you! We know that we will enjoy your blog and look forward to keeping in touch. Here in Southern California where I live only a mile or so from the beach, I'm used to seeing sea shell motifs in interior decor. I love the idea of bringing a little bit of the sea shore to your home in landlocked Budapest! How wonderful to live so close to the beach. Whilst in Brighton we face the sea, in Budapest it is something we miss very much having to content ourselves with Lake Balaton. Not quite the same! Oh what a lovely morning I have spent with you both in your gorgeous Hungarian home. However, I must get on with things, this is the last week before my Illustration Course begins on the 12th. I am working on a Summer Sketchbook of doodling, drawings and daydreams. Your Belleek (Irish connection noted!) teapot has truly inspired me, as I am doing an ink drawing of a Mad Hatter's Tea Party and it would look perfectly at home on the table. The shelf below the window in my bathroom is covered with seashells collected from my travels and it took me ages on Saurday to dust them all. How lovely it has been for us to read all your wonderful comments, although we are sure that your morning needed to be spent on other things. Your ideas for the 'Mad Hatter's Tea Party' sound great fun and we hope that we shall be able to see the fruits of your labours in a future post. We love the Belleek china and keep trying to find more at a reasonable price but have miserably failed so far. We have it carefully ensconced in a china cabinet as we fear that we should break it if we attempt to use or clean it. Thank you for your kind words. We shall look forward to the 'Mad Hatter' drawing.....it could nearly be named after us!!! !